When I was young, my understanding of the world often took me no further than what went on inside my house and on my street. The bike I owned, the friends I played with, my parents, my siblings -- I thought that all of this was the experience of everyone, not just me. If I experienced it, the whole world experienced it. Saturday mornings were a favorite time. That was the morning I would get up early and watch cartoons. Speed Racer, Honk Kong Phooey, Land of the Lost, Underdog, Scooby Doo, Super Friends… I even remember the commercials. I learned how bills are passed and the difference between adjectives and verbs. I learned about the larger world from a segment called “In the News.” It would start off with a drawing of a rotating globe comprised of latitude and longitude lines and it was accompanied by this funky synthesized xylophone/piano-like music. Then the narrator would announce “In the News…” and off I would go to some place quite far from my neighborhood. As a child, it was all vaguely engaging but mildly disconcerting. The stories were weird. Off-putting. What did I know? The color brown. Malnourished kids. Farms. Third-world countries. I was a child. What did I know? Then, when was it? Late morning or early afternoon? Creature Double Feature would be on. Swamp creatures, Godzilla, men with x-ray vision, vampires, giant insects attacking villages, invading aliens. God, I couldn’t get enough of it. After I had my fill, I went out into fresh air, friends, daylight, and I played. Saturdays were wonderful. One day I found myself at a friend’s house having lunch. His mom was fixing us peanut-butter and jelly sandwiches and she sliced the bread diagonally. My jaw hit the counter. What was this? Amazing. Was it still edible? Up until that point I had only known the Parthenon-like rectangular way to cut a sandwich. This was revolutionary. “In the News” was beginning to look a little less mysterious. But to this day I can walk into a stranger’s house and be a little frightened at the way they do things. For years, I had no idea what a hamper was. Growing up, our family chucked all our laundry into the downstairs bathtub. I thought everyone did this. The first time I saw a hamper in someone else’s house I thought it was for garbage. What does a child know? My mom once sent me into the store to by Soapine. Fine. I went in and asked the lady where the Soapine was. Who is this lady who doesn’t know what Soapine is? Am I still on planet Earth? At the same time, I was irate at my Mom for sending me into a store to purchase a product that did not exist. 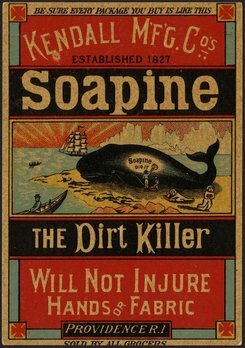 Turns out Soapine was the brand name of a laundry detergent my Mom grew up with, but it hadn’t been made in 20 years. My Mom just used the term Soapine to refer to any laundry detergent. I’ll end it there.